Sales forecasting is the process of projecting future sales or revenue based on factors such as past sales performance, upcoming campaigns or initiatives, marketplace trends, and competition. It helps you become familiar with factors influencing sales, allows you to engage in the right activities, and is typically created using a spreadsheets or CRM software. While spreadsheets can be good tools for creating a sales forecast, a CRM can automate much of the work for you. Pipedrive, for example, has sales forecasting tools that quickly and easily allow sales managers to accurately forecast their sales for a selected period of time. To give sales forecasting a try, sign-up for a free trial with Pipedrive. If your CRM does not offer built-in sales forecasting, a spreadsheet can be used to create a sales forecast manually. While this method can be more time-consuming as data has to be manually entered, this method does allow businesses to create a custom forecast specific to their needs. 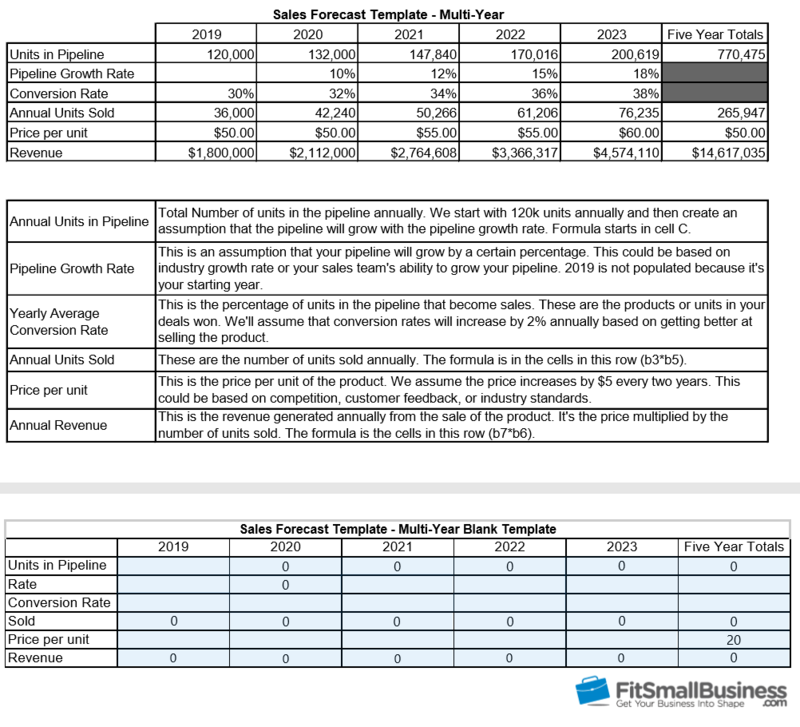 To help you get started creating a sales forecast using the spreadsheet method, we have created a template you can use to speed up the process. Sales forecasting works by taking historical sales data, current sales data, and industry trends and using it to predict future sales for your product or service. For instance, if you historically only close 25% of a particular type of deal, this closing ratio should play a role in projecting future sales. You can use this information by looking at the total number of this particular type of deal in your pipeline and multiplying by 25% to get an accurate forecast for closed deals. If sales in your industry is heavily impacted by seasonality — for instance, you historically close 90% of a particular deal type during peak season — you can predict or forecast that you will close 90% of current deals in your pipeline. The most important thing is to use your best judgement based on what you know about your sales team and the market environment you operate in to create the most accurate sales forecast possible. Having a formal sales plan and established sales quotas make forecasting easier, and you’re not starting with a blank page. Integrating elements of your sales plan, sales quotas, and even CRM analytics into your sales forecast will help ensure that you hit your overall sales targets. Sales forecasting is important to the sales management process because it is a key indicator of how the business is performing. It gives you an idea of how much revenue to expect within a certain time frame. Projecting sales also lets you know whether or not you need to focus on sales acceleration or lead generation strategies. Businesses use this information to make important financial decisions, such as whether or not to expand or get a small business loan. It also helps project how close you are to reaching sales targets. This dictates compensation and lets you know if you’re on track to getting any bonuses, incentives, or winning any competitions. When used for this purpose, you can create strategies to prioritize the deals that will help you achieve your personal goals. There are several important factors to consider when creating sales forecasts, including deals won, deals lost, current deals in the pipeline, and marketing efforts. Other important factors include competitive, seasonality, and economic environment. Looking at past deals won helps give business owners and sales managers a sense of the type of deals that are most likely to close. It allows them to look at what these deals have in common and should spark some ideas as to what can be done to either ensure they close or to ensure they close at a more accelerated pace. A CRM is a great tool to help you identify trends and what deals are most likely to be won. Pipedrive, for example, includes a helpful visual pipeline tool that displays all your deals at a glance in an easy-to-read, visual Kanban format. Deals can also be filtered by status, making it easy to see historical wins. Click here to start for free. Reviewing the deals you’ve lost helps you come up with a plan or a protocol for managing similar deals. It can also help you prioritize your opportunities by having your team focus on deals that look similar to those they’ve won in the past, as opposed ones they’ve lost. A forecast metric can then be created around the percentage of lost deals that can be won through additional incentives or by being assigned to a different salesperson. Current deals are most important in sales forecasting because this is where your future sales and revenue come from. Evaluating your current deals gives you information like what pipeline stage they’re in, the activities that still need to be completed before the deal closes, and whether or not the deal is at a point where it can be closed right away or if it’s still in the early pipeline stages. Information about current deals is the main driver in the sales forecast numbers. With marketing efforts and special initiatives, current deals may have more of a probability to close. For instance, if the marketing team is putting together a customer incentive to make a purchase before the end of the month, there may be additional deals in the pipeline that close so that customers can take advantage of the special incentive. This can also be applied to lost deals that may be recovered with a special lost deals promotion. The economic environment can have an impact on your sales, especially if your product or service is not perceived to be a necessity. For instance, if your product is seen as a luxury and the economy is in a downturn, sales will be softer than if the reverse is true. Sales managers and business owners should have a sense for this and be prepared to come up with ways to increase sales despite the environment. Knowing your competitive environment is key to sales forecasting since competition can lower prices, which then impacts revenue. Your competition can also influence your number of units sold should your customers choose to buy competing products from them instead of you. Business owners and sales managers should pay attention to what the competition is doing in case there is a need to respond to win deals. Seasonality is an important factor that can drive sales up or down. If you are creating your sales forecast during peak season for your product or service, you can project that more of your sales will close than not. The opposite is also true. If you are forecasting sales during a slow season, you’ll need to account for this when forecasting sales. There are different types of sales forecasts, each with their own benefits and uses. However, all are time-based, e.g., monthly, quarterly, yearly, and multi-year. There are also different ways to approach forecasting, from using historical data to forecast future sales to using the confidence levels of your sales team to predict sales based on deals they feel will close. Because sales forecasting is part art and part science, there are many ways to approach it. You’ll need to establish why you are doing a sales forecast, gather relevant data that impacts your sales, determine the scope of your forecast, and then lay it out in a way that keeps your team focused. Before you start creating your sales forecast, it is important ask yourself how you intend to use it. Is the purpose to identify sales trends you need to address, or do you want to use the information to motivate your sales team? The answer to this question will help guide you as you create your forecast so you can better achieve your objectives. Review your relevant historical sales data to identify patterns you can use in your current sales forecast. Historical sales data can tell you if your sales typically dip in the summer or surge during Christmas, so you know what to expect. Your sales forecast should then account for a similar spike or dip. If your industry is growing by 20% year over year, has a small number of competitors, and most industry analysts predict continued growth, you’ll want to incorporate this information into your sales forecast. Internal activities, such as marketing campaigns, downsizing your sales staff, or closing retail locations, will have a direct impact on your sales. These activities should be considered in sales forecasts. For example, if you expect to see 20% growth in the spring following an email marketing campaign, make a note to include that in your forecast. Determine what you will or will not include in your sales forecast, such as the period of time your forecast is covering, the product line, or the sales team you are doing sales forecasting for. This information should support the sales forecast objectives you outlined in step one. Once you understand the scope of your forecast and the factors that could impact it, decide on the layout, or how the information will be displayed. For example, a multi-year table with graphs may work for you, or a display on a Kanban board in a CRM with the current and the following month’s projected sales may be the better option. There is no wrong answer as long as the data displayed is meaningful to you and supports your objectives. Below is an example of a sales forecast using a fictitious scenario with Joshua’s Perks, a coffee catering company that serves medium-sized businesses without cafeterias. This scenario relies on historical sales data and takes marketing initiatives and seasonality into consideration. From June through August for the last three years, Joshua’s Perk’s Corporate Coffee Catering has noticed a 20% decrease in premium coffee capsule sales. Last year, in 2018, to combat this decrease, Joshua’s tested a marketing campaign in August where he saw a 30% increase in units sold. This year, he plans to roll-out this campaign in June, July, and August. In this way, his forecast takes the impact of both seasonality and marketing initiatives on future sales into consideration. By creating a forecast, Joshua’s Perks is able to get a feel for the number of units they are likely to sell and the amount of revenue they are likely to generate in 2019. If you’re technologically savvy, you may choose to develop a computer program for forecasting in a language like Python. However, the primary tools used in sales forecasting for small businesses are Microsoft Excel, Google Sheets, and CRMs with sales forecasting features. Each offers its own distinct benefits and drawbacks. Microsoft Excel and Google Sheets both allow you to create sales forecasts with variables like deal sizes, likelihood to close percentage, and past sales data. The advantage of using either Excel or Google Sheets is that the cost is minimal and they can be easy to customize. The disadvantage of using either of these programs is that you or someone in your company will have to set up your sales forecasting model and formulas from scratch. A CRM houses all of the data you’ll need for sales forecasting. 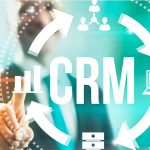 Therefore, the advantage of using a CRM is you can often generate a sales forecast report at the click of a button without having to create formulas or find historical sales data. 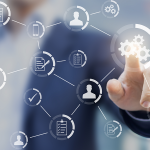 The disadvantage is limited customization options, as you’ll be limited to the sales forecasting reports they come with unless you download your CRM data into a spreadsheet and create your own reports. For example, Pipedrive CRM offers a sales forecasting view known as a dashboard. This means there is no need to calculate deals won or lost and it will give you the dollar amount of both by month. Even better, you can also get a snapshot as to whether or not there are tasks that are past due that may be preventing deals from being won, without leaving the tool. 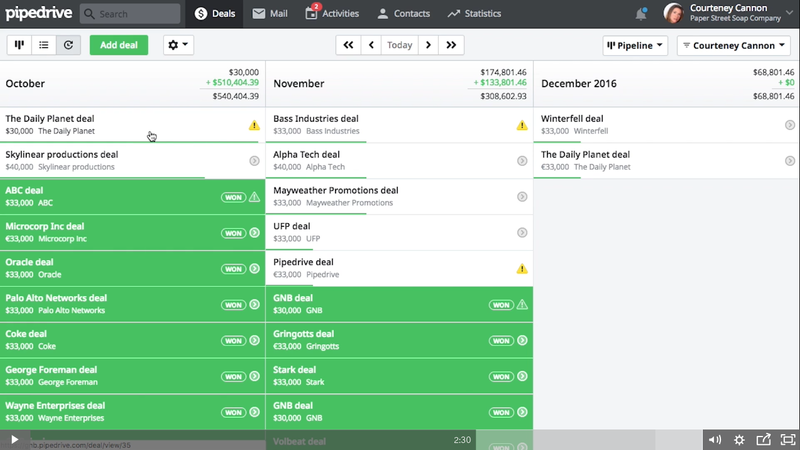 An added benefit of Pipedrive’s visual sales forecast is you can quickly see which deals require specific action that can move it closer to being a deal closed. 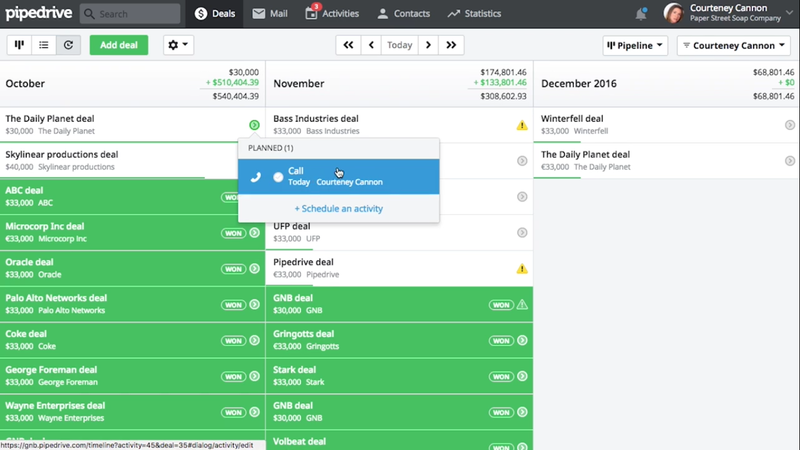 You can also add or edit activities within your deals right from the Sales Forecast dashboard. 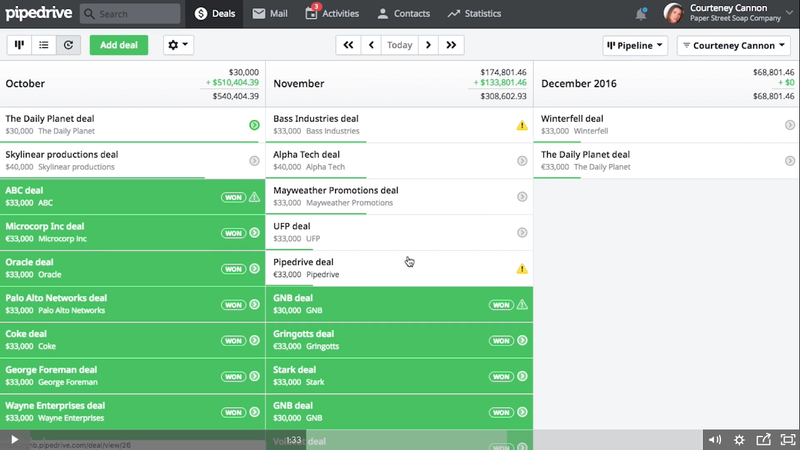 In Pipedrive’s Sales Forecast view, you can mark deals as won or lost with a click of a button. The dollar value in your Deals Won and Deals Lost categories will automatically update. To learn more about Pipedrive’s visual pipeline tool and how it can be used to help improve sales forecasting, visit their website and sign up for a risk-free trial. Sales forecasting is the process of projecting future sales and/or revenue based on a variety of internal and external factors, including past sales performance, upcoming campaigns or initiatives, market trends, and competitive environment. Why Is a Sales Forecast Important? Forecasting sales is important because it communicates the overall health of the business in advance. It also informs you of actions you need to take to reach goals or targets you’ve set if there are any negative gaps between the sales forecast and the target sales goal. What Factors Should I Consider in a Sales Forecast? There are a set of internal and external factors that should be included when doing a sales forecast. Internal sales factors include past sales, current deals, deals won, and marketing initiatives. External factors include economic environment, competitive environment, and seasonality. These factors have an impact on sales and should be taken into account when doing sales forecasting. Sales forecasting is a useful exercise that is helpful in predicting the number of sales and the revenue tied to sales for a specified period of time. It can be done using Excel, but a better, more efficient way of doing a sales forecast is by choosing a CRM, like an analytical CRM that comes with those features. See our article on types of CRMs, which covers analytical CRMs. Pipedrive is a CRM that comes with advanced reporting tools that include sales forecasting. With Pipedrive, not only can you forecast sales, you can also view activities you need to complete to close deals on a Kanban board. To try sales forecasting from within Pipedrive, sign up for a free trial.